One of the best things about this company is that they are completely transparent. In fact, they maintain a list of winners on the website where anybody can see the names. The names are also available on search engines where one can find the list of winners by searching online. They offer many different kinds of giveaways including instant games and other types of giveaways. They also have a number of different ways of notifying the winners. 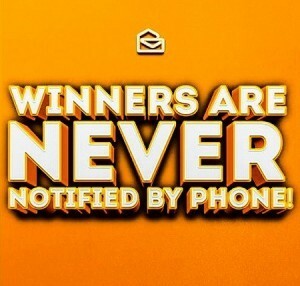 For instance, if you are playing one of the instant games and turn out to be a winner, you will be instantly notified when a pop-up will start flashing on your screen telling you that you have won the prize. It is extremely important to click on the pop up and provide all the details that are needed by the company to give the prize money to the winner. Major prize award and SuperPrize winners are not notified via email. As far as different ways of notifications are concerned, these are mentioned on the terms of service page as well as on the blog. Therefore, it is recommended for winners to take a close look at the terms of service as well as on the blog to make sure that they are able to claim the prize money and are aware of the ways in which winners are notified by the company. The company also notifies through e-mail in case of gift card winners. The instructions for claiming the gift card is provided in the e-mail and the winners are required to complete certain steps to claim the winnings. Overall, the notification process by the company is extremely simple and straight to the point. They maintain complete transparency and this is the reason that they have been so popular for so many years. « Do you have to pay Sweepstakes Taxes in the US? I would love to be surprised. Oh my how nice it would be as well as a huge blessing and life canging experience. Of course I have been entering and playing and entering and playing and sending all my mail entries back in a timely matter yet reality tells me I am a huge dreamer Oh well been entering for 30 years now HMM but it is nice to know that if I ever get lucky wnough to win SOMETHING and hopefully it is a big one at least I know they will let me know and how they let me know as I never knew this now I do Good Luck everyone we are all in it to win it and hope someday my day will come. In the meantime I will still play and enter and do the best I can to be persistant!!! I have nothing to lose it is free right? Well except for the stamp to end the mail entries back!!!! 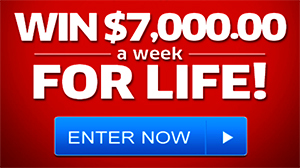 I am trying every day to win the $2,000,000.00 plus $10,000 a month for life and a brand new car! I am 61 yrs. old. I lost 2 girls and a boy due to birth defect which ended up in a hysterectomy which caused me to now have the brittle bones disease and RA, osteoarthritis, Osteoporosis and a lot more. I am living alone in a rented 1970 12×60 trailer. It has been condemned. The roof is caving in, chunks of the ceilings have fallen in. The floors all have huge holes. The walls are no longer attached to the floors. You get what I am saying. I lost 19 teeth at one time because the bones that held them in crumbled, then I had to have the rest of the bones removed due to pulling the teeth. I have been divorced and living alone since 1995. I have three older brothers and their families but they live miles from me My younger sister was beaten to death during a home invasion, on the property I sold her in the back of my home. I moved here sold my home and I have been trying to move back home into a disabled/elderly complex but I only get $755.00 a month so I have asked for help from all state and Government agencies I can. I really never cared or gave much thought of being a rich woman. I just need money to get safe haven and the medical care I will be needing. I want to go home to my family. I want to be in a large community of people that can lean on me and maybe then it will be easier for me knowing that I can help others and not dwell on my own health issues. My doctors say they can’t do anything for me, to prepare my future from being confined to a wheelchair and eventually bed written. As for as if I won all that money I would make sure that the disabled and elderly have the eye care, dental care, hearing aid and a safe place to live where they can live the rest of their lives as happy and comfortable as possible. And of course I would help my most wonderful three bothers and all their families with whatever they need. I have a lot of pain trying to keep up with all the grants and sweepstakes but I guess the pain and the drive I have always had to take care of myself, not to be a burden on anyone keeps me going and not just give up. I pray for God to give me strength every day and maybe the hope and ability to give back, if I win the sweepstakes was his plan all along. If not it will hurt me but it will not stop me! I will never give up the hope, joy and love I carry in my heart! Best of luck to all of us! I would love to win $10 Million Dollars I would help so many people,but first I would pay my tithes to the [LORD]I been enter PCH for I believe about 30yrs. PCH claim all win a week for life 28 abril 2017.T. i am in it to win have been filling out and emailingsweepstakes for 14 years so i would like to see you at my door .let me know if you can thanks. I love all the ads you all send me if I win I would help so Mandy people it would answer all my prayers thank you . I can I find out if had winning numbers for past couple Months I keep calling with numbers and keep hanging up did anyone win the 10,000.00 a week for life or the 7,000.00 a week for no I wandering why ? I in it to win the sweepstakes of $10 Million Dollars I want to see Lucky The Big Check at My Door and Give Him a Big Hug !